First off, do I not have the cutest kitten ever? Ever ever? Now for the best biscuit recipe EVER. I’m going to warn you right now: don’t read this post any further unless you’re willing to make a commitment. A serious commitment. A commitment to carbs. If you’re low-carb, no-carb, anti-everything-that’s-good-in-this-world-carb, then stop. (Anyways, I don’t know why you’d be reading my blog if you hate carbs…) Just don’t say I didn’t warn you. These, these are crack biscuits. I swear there’s got to be MSG or crack slipped in them somehow while I’m not looking. Maybe there’s some major chemical change while they bake. Maybe, just maybe, the southerners did something right. The problem is, I can’t stop making them. This is my…7th? batch or so in two weeks. Seriously. At first I didn’t have self-rising flour, and even though they were super dense and tiny and probably not that good, I kept making them will all-purpose flour until I went to the grocery store to buy flour specifically for these biscuits. I’ve also used up an entire jar and a half of veganaise on them too. And why are they so good? Baked in a muffin tin, they get more crispy on more area, leaving a golden satisfying hardness with each bite of the bottom. But on top and in the middle they are so light and so fluffy and so buttery and so satisfying. I’m eating my 3rd one of the morning as I speak. And did I mention they only need three, THREE!, ingredients? Mix all ingredients together in a bowl. Spray a muffin tin with oil. Spoon the biscuit batter into the muffin tin so that each cup is half-full. Bake for 15-20 minutes or until the bottoms of the biscuits are golden-brown. The biscuits look great- I can’t believe they only require three ingredients! I will have to try them someday soon. 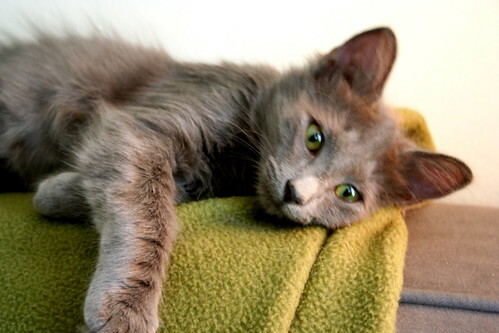 . .
We want to get a new kitty sooooo badly, and you’re just making me want one even more with that little Dorian! Three ingredients?! Freaking genius! OHHHH my granny used to make them like this (with real Duke’s Mayo of course)!!! I never thought of using Veganaise!!! Genius! Pure genius! Cute kitty! aaah, you’re killing me, my jar of nasoya is way way at home, and I neeeeeeed biscuits! I guess I’m safe for a while longer? Oh my. Vegenaise is already like my favorite food over here! Those are dangerous.Your kitty is very beautiful, especially her green eyes! You had me at “mayo”. 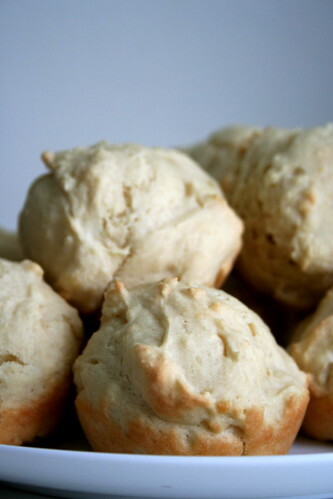 I just made these biscuits, and they were deeelicious! I didn’t have self rising flour, so I used regular flour and added 3 tsp baking powder and 1 tsp salt. You were unaware that veganaise turns into crack cocaine when used as a baking ingredient? So what you’re telling me is that a blissed-out carb coma is only three ingredients away? Incredible.Everything tastes better when served over a biscuit. cute cute kitten!I need those biscuits..I need them now! Those are awesome! My 10-year old just made the second batch in our household; I made the first batch and served it with a vegan gravy. Thanks! I’m intrigued by the short list of ingredients, how cool is that?! Ok, I have to comment again. You’re not kidding about crack. My daughter just made two more batches (the next day). i’ve been making these biscuits for some time now… thought i better post and say just how scrum-diddly-umptious they are!!! and i melt a little every time i come back to this blog to check the baking temp/time & see that adorable kitty!!! That makes me so happy–glad the recipe is working out for you! I haven’t made these in awhile–I need to get on that!